To view the whole program, as well as the Award honorees for 2016, click here. On behalf of the 42 Board of Directors and our 2016 Program Chair, Lauren Behrman, I present you with this awesome 2016 APA Convention Program in Denver. In line with my presidential themes of Diversity, Sustainability of Practice, Leadership Development and Practice Innovation, Lauren has put together an exciting program with diverse CE opportunities. In response to Lauren’s enthusiastic and resolute calls for programming this community delivered, yielding an exciting palette of programs on topics including, but by no means limited to, growing, enhancing, models for and the business of practice; telepsychology; clinical programming on topics such as eating disorders, therapist self-care; and forensic topics such parent coordination and professional credibility in the courtroom. The Division’s Denver Convention program spans 4 days and contains 12 CE program to choose from and 6 posters. 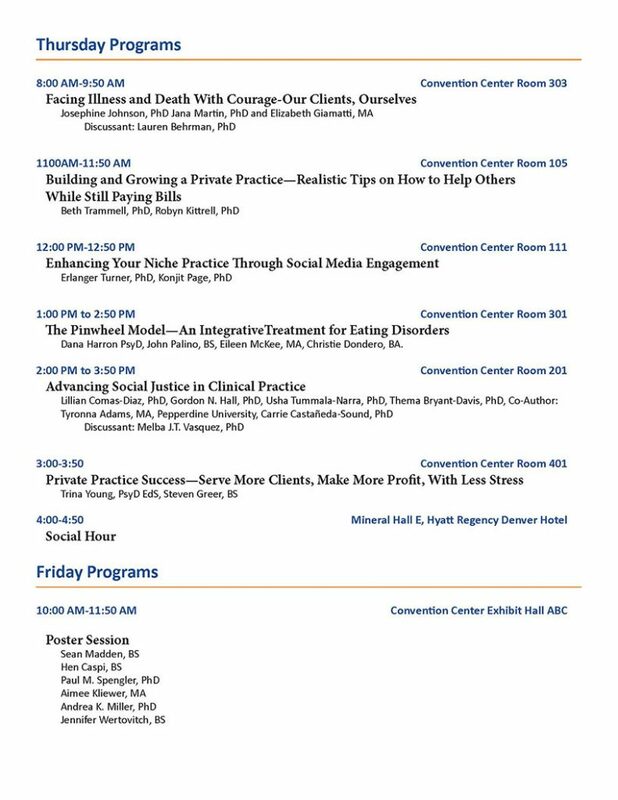 Additionally, the Division is listed on 5 collaborative programs and is serving as the lead Division on a collaborative program on Advancing Social Justice in Clinical Practice. One of Lauren’s creative ideas was to have one day of programming dedicated to practice, which she aptly named – a Practice Summit. So you will find that on Thursday, the first day of Convention, there are a number of practice based offerings and the day will end with a social hour from 4:00pm to 4:50pm geared towards networking and discussion starters on issues related to practice. As you know Steve Walfish was an ardent advocate of practice and so his lessons regarding the longevity of practice will be a spirit guide of sorts for our discussions on practice. Be sure to join us at the larger Division Social Hour on Saturday at 6pm, for a celebration of Steve Walfish’s life and for presentations to our award recipients. Also on Saturday, there will be a Board meeting from 11am to 4pm. Members are invited to attend; however, the first 30 minutes of the meeting will be dedicated to members’ questions etc. about the business of the Division. Please take a moment to review the Division’s program and if you are a traditionalist, please highlight our program in your program book. If you are a techie or striving to be a techie, when you download the Convention program app, please be sure to search for and add the Division’s programs to your Convention calendar. However, you do it, these programs are too good to miss – So don’t! Our Division presenters would love to see you in the audience and so would I!